Van (Turkish: Van; Armenian: Վան; Kurdish: Wan‎; Ottoman Turkish: فان‎; Medieval Greek: Εύα, Eua) is a city in North Kurdistan / southeastern Turkey, on the eastern shore of Lake Van. The city has a long history. It has been a large city since the first millennium BC, initially as the capital of the kingdom of Urartu in the 9th century BC and later as the center of the Armenian kingdom of Vaspurakan. Today, Van has a Kurdish majority and a sizeable Turkish minority. 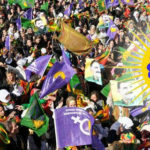 In 2010 the official population figure for Van was 367,419, but many estimates put it much higher with a 1996 estimate stating 500,000 and former Mayor Burhan Yengun is quoted as saying it may be as high as 600,000. Van is also a university city. It is famous for its incredible breakfasts, and for curious white cats with one green and one blue eye. Kurdistan is not a poor country; it is a country that is being made poor. The lack of Coca Cola does not make us poor. Capitalist modernity, as Ocalan defines it, makes us poor. It wants to belittle people’s own production and to impose on the society capitalist mass production. That’s why the co-operatives and the communes that we have been establishing made the state feel uncomfortable. Because this represents a logic of rupture from mass production and a move towards the use of our own resources. The state was losing its market in Kurdistan.